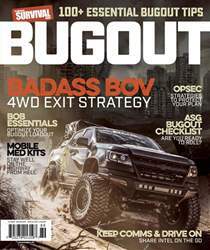 Digital Subscriptions > American Survival Guide > Bug Out 2018 > FIRST WORDS BUG OUT! Bugging out is one of the most broadly discussed topics in the prepper universe. You can easily find huge volumes of information, gear, supplies and advice solely dedicated to leaving your compromised base location and taking up residence in what you hope will be a safer, more secure spot somewhere over the horizon. While most of us hope and plan to hunker down at home when a survival situation arises, we should all have a backup plan that allows us to move to a secondary location if that becomes a necessity. Whether your home-awayfrom- home is a hidden lair deep in the woods, a relative’s house outside the danger zone or a Red Roof Inn situated just far enough away from the hurricane track, you’ll need a decent plan for who, what, where, when, why and how you’re going to get there.